One of the pre-eminent examples of post-War, residential Japanese-style gardens – the Hannah Carter Japanese Garden – is under threat. The garden was designed in 1959 by Nagao Sakurai and Kazuo Nakamura, and subsequently purchased through a gift to the University of California, Los Angeles (UCLA), with the understanding that the university maintain the site in perpetuity. The university now plans to sell the garden and they have removed important character-defining elements including a five-tiered stone pagoda. In 1923, Los Angeles landscape architect A. E. Hanson created a Hawaiian inspired rural retreat, for his client Harry Calendar, in the exclusive Bel Air subdivision. In 1959, after the property’s sale to oilman Gordon Guiberson, noted Japanese garden designer Nagao Sakurai was commissioned to create a Japanese style garden on the steep one-and-one-half-acre hillside located below the residence. 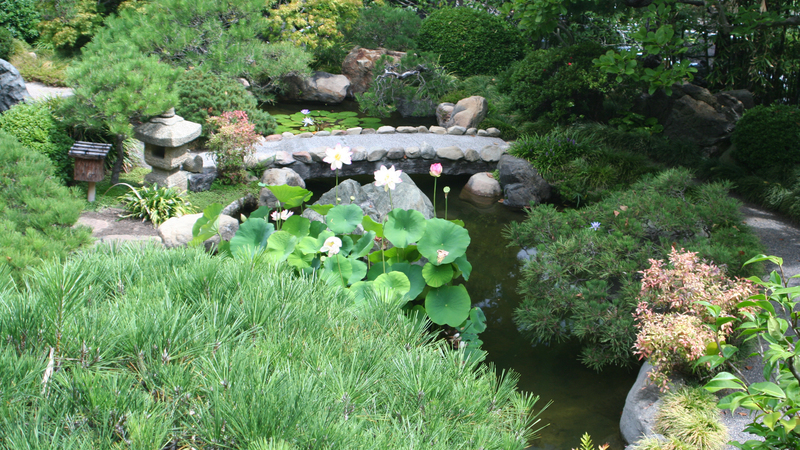 Sakurai, a recent immigrant to the U.S. had previously designed the Imperial Japanese Gardens at the 1939 international expositions in San Francisco and New York. By 1961 Sakurai and Kazuo Nakamura, a renowned garden expert from Kyoto, had transformed the casual California country place into an exquisite Japanese garden. Sakurai and Nakamura sculpted a dramatic garden, inspired by those in Kyoto, into the steep hillside, using 400 tons of lichen-covered stones from Santa Paula Canyon north of Los Angeles, and another several hundred stones from rock quarries at Mt. Baldy east of the city. Many of the garden’s elements were imported from Japan. The entry gate, family shrine and teahouse overlooking the pond, were built in Japan, dismantled, and then reassembled onsite by Nakamura and his Japanese craftsmen. Stone objects brought from Japan edge the paths: lanterns, water basins, carved stones, and natural stones of symbolic significance. Additional prominent design elements from Japan include the Buddha stone, a flat carved stone representing the Buddha seated in 16 positions; a 9.5 ton ship-stone; and a five-tiered stone pagoda. The entry to the garden lies at the base of the hillside. Paths extending upward into the garden lead to a central koi pond edged by a black pebble beach. Stepping stones and stone bridges provide passage across the water. A wide variety of plantings, many of them with Japanese origins hug the water’s edge, including sculptural specimen pines, bamboo, magnolia, maple and camellia trees, while water lilies bloom on the pond’s surface. A stone pagoda was positioned at the bottom edge of the pond, with a Japanese teahouse overlooking the pond from its western edge. At the garden’s highest point sits the family shrine that shelters a hand-carved gilt Buddha (one of the items removed). Remnants of A. E. Hanson’s original Country Place Era estate design, including the Hawaiian garden, with its original plantings and a 20-foot waterfall remain on the west side of the slope. At the garden’s easternmost edge, Hanson’s stone bathhouse with outdoor sunken bath is part of the landscape’s continuum that includes a moon-viewing deck that comingles with Nakamura’s barbeque area and its stone mosaic counter which depicts chrysanthemums and camellias. The Garden was obtained by the University of California in 1964, through a gift by Edward W. Carter, Chair of Regents of the University. Through an agreement with Carter in 1982, the garden was renamed in honor of his wife, Hannah. At the same time Carter made known his desire that the Univesity establish a $500,000 endowment to maintain the garden indefinitely. In 1969, extensive flooding resulted in a mudslide that damaged the historic garden. UCLA Campus Architect and professor Koichi Kawana oversaw the reconstruction of the space, which was funded by the friends of the UCLA gardens. Kawana would go on to become the leading designer in California of Japanese style gardens in North America in the 1970s and 1980s. Although the University accepted the gift of this garden and the responsibility to maintain it in perpetuity, the garden will be for sale to the highest bidder in early February 2012. Brad Erickson, UCLA’s executive director of campus service enterprises, has stated that the sale is needed to fund endowments and professorships specified in the Carter gift. On January 17, 2012, UCLA removed valuable objects from the garden including the five-tiered stone pagoda and the wooden Buddha. Write to UCLA Chancellor Gene Block, chancellor@ucla.edu and the University of California Regents regentsoffice@ucop.edu urging a halt to the sale, and return of the objects. Ask that UCLA work with interested organizations and individuals to secure a public-private partnership to maintain and operate the Hannah Carter Garden for future generations to both learn from and enjoy. Brown, Kendall H. Japanese-Style Gardens of the Pacific West Coast. Photographs by Melba Levick. New York, Rizzoli, 1999. Brown, Kendall H. Email to Judy M. Horton, 10/22/11. Erickson, Brad A. Letter to Antonia Adezio and Judy M. Horton, 11/4/11. Erickson, Brad A. “Hannah Carter Japanese Garden-removal of objects” email to Judy M. Horton et al. , 11/22/11. A Garden That Reminds One of Kyoto, The Japanese Garden of Mr. & Mrs. Gordon G. Guiberson at Bel-Air, California. San Francisco: The Grabhorn Press, . Hampton, Philip. “Campus to sell Japanese garden and estate to meet intent of property’s donors." UCLA Newsroom, November 10, 2011. Hanson, A. E. An Arcadian Landscape, the California Gardens of A.E. Hanson, 1920-1930. Ed. by David Gebhard and Sheila Lynds. Los Angeles, Hennessey & Ingalls, 1985. Pp17-18. The UCLA Japanese Gardens, a garden that reminds one of Kyoto. Friends of the University Garden, [n.d.].